Street League Skateboarding (SLS) today announced that the coming SLS Nike SB Super Crown World Championship – the official street skateboarding world championship as recognized by the International Skateboarding Federation (ISF) – will include a women’s division allowing the world’s best female street skateboarders to compete for the title of SLS Nike SB Super Crown World Champion. This historic announcement not only opens the competitive aspect of the sport up to all the world’s best street skateboarders, but further solidifies the competition framework for skateboarding. With the fast paced growth of skateboarding, an accurately defined and credible pathway for both male and female competitive skateboarders around the world to achieve World Championship status is imperative. Since its inception in 2010, SLS has taken street skateboarding from a disparate collection of independent events to a global competitive platform built on a premium qualification system of amateur-to-professional progression. The development of this Road to Super Crown structure has been greatly strengthened under a unique partnership with the ISF, reinforced by a long-term partnership with Skatepark of Tampa to incorporate the Tampa Pro, Tampa Am and Damn Am Select Series into the SLS framework as talent feeder events. Preceding the official season of arena events, the SLS Nike SB Pro Open takes place for the best international hopefuls to earn their way into the Tour alongside veteran SLS Pros. From its inception as an invitation-only event series for the most elite street skateboarders, SLS introduced their concept to evolve the sport and grow the SLS Nike SB World Tour into a year-round qualification program reaching all of the very best in street skateboarding. SLS’s unique and proprietary ISX™ instant scoring system translates the language of skateboarding to its ever-growing global fan base by considering not just the trick complexity, but the essential skateboarding characteristics of the athlete’s personal style and technique. For the first time in history, women will have the opportunity to compete in the true street skateboarding contest that defines the only World Champion as recognized by the ISF. 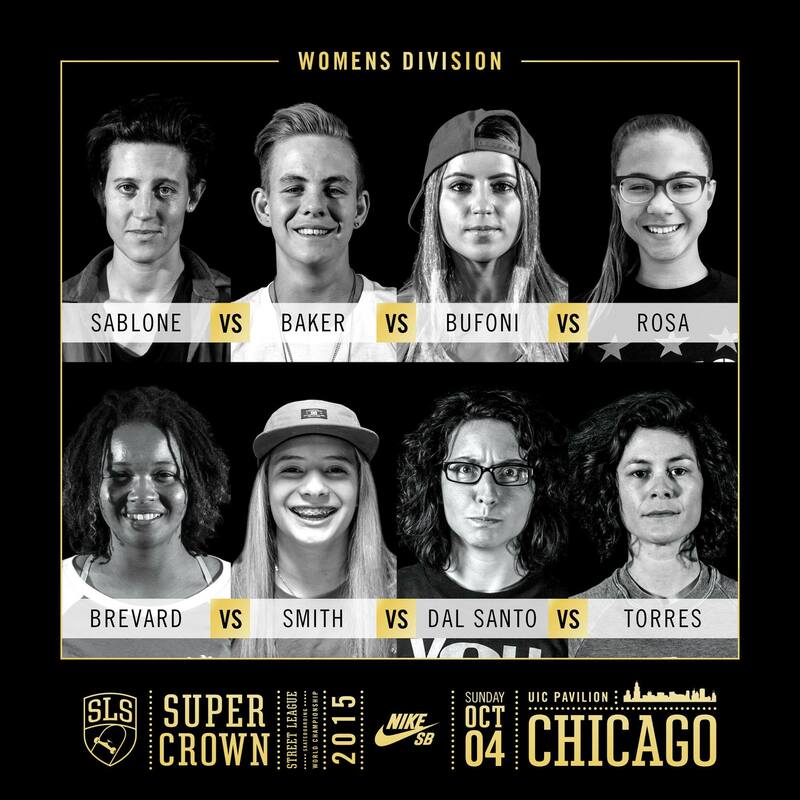 Curated in conjunction with the Women’s Skateboarding Alliance (WSA), the women’s division at the SLS Nike SB Super Crown World Championship in Chicago, IL on October 4th will bring together the world’s most accomplished female skateboarders to battle it out for the title of World Champion and for the highest first place prize purse in women’s skateboarding. “SLS has grown so quickly in the last six years,” says 2013 SLS Super Crown World Champion, Chris Cole. “Having the opportunity for all elite skateboarders from anywhere in the world, male and female, to compete in SLS is a natural next step for SLS knowing the progression and forward thinking of the League. This will only help accelerate the growth of skateboarding, exposing it to more people.” SLS is the only skater-owned elite contest in the world and is built on a vision to bring the best in skateboarding to its core audience while also making the contest entertaining and understandable for the casual fan. With the inclusion of a dedicated female event, the SLS Nike SB World Tour has unquestionably elevated itself to the most comprehensive skateboarding competition series that the sport has ever seen. The Top Eight male Pros for this year’s SLS Nike SB Super Crown World Championship have been determined through their outstanding performances throughout the League season, which included gaining Championship Points from a set of two ISF-sanctioned qualifier events and two SLS Nike SB World Tour contests. Reigning Champ, Nyjah Huston is set to defend his title in what will certainly be an explosive Championship taking place at the UIC Pavilion in Chicago, IL. Selected for their professional performance throughout the past year and contributions to street skateboarding as a whole, the female roster competing for the first-ever female title of SLS Nike SB Super Crown World Champion and a $30,000 first-place cash prize purse with one-of-a-kind Nixon watch will consist of Leticia Bufoni, Lacey Baker, Pamela Rosa, Samarria Brevard, Alexis Sablone, Vanessa Torres, Marisa Dal Santo, and Alana Smith. The Women’s contest will be webcast live around the world on StreetLeague.com on October 4th starting at 2:45pm ET. In partnership with FS1, the Women’s contest will also have it’s own dedicated one-hour premiere special telecast on FS1 and FOX Sports GO on October 18th in the USA. The first contest including Women in SLS is shaping up to be a truly historic moment in skateboarding fans won’t want to miss. Fans in the United States can watch the 2015 SLS Nike SB Super Crown World Championship on FS1 and customers of participating cable and satellite TV providers may access the live stream of the Tour stops through the FOX Sports GO app for iOS, Android, Windows and Kindle devices, as well as on desktops through FOXSportsGO.com. International fans can catch entire the official live webcast exclusively on StreetLeague.com. Street League Skateboarding (SLS) is the first-ever professional league for street skateboarding. SLS features 25 of the world’s most exciting skateboarders competing in an easy-to-follow, ISX™ instant scoring format on one-of-a-kind concrete skate plazas around the world, all for the largest prize purse in skateboarding history. Each Season, the elite SLS Pros compete for valuable championship points in hopes to advance to the Top Eight that will compete for title of Champion in the official street skateboarding world championship as sanctioned by the International Skateboarding Federation, the SLS Super Crown World Championship. Each World Tour stop of the 2015 SLS season will air live on FOX Sports 1 and FOX Sports GO with a live international webcast on Streetleague.com. For more information, visit www.streetleague.com and follow @streetleague. FOX Sports is the umbrella entity representing 21st Century FOX’s wide array of multi-platform US-based sports assets. Built with brands capable of reaching more than 100 million viewers in a single weekend, FOX Sports includes ownership and interests in linear television networks, digital and mobile programming, broadband platforms, multiple web sites, joint- venture businesses and several licensing partnerships. FOX Sports includes the sports television arm of the FOX Broadcasting Company; FS1, FS2; FOX Sports Regional Networks, their affiliated regional web sites and national programming; FOX Soccer Plus; FOX Deportes and FOX College Sports. In addition, FOX Sports also encompasses FOX Sports Digital, which includes FOXSports.com, FOX Sports GO, Whatifsports.com and Yardbarker.com. Also included in the Group are FOX’s interests in joint-venture businesses Big Ten Network and BTN 2Go, as well as a licensing agreement that establish the FOX Sports Radio Network. Established in 2004 and now with partnerships with more than 80 member countries, the International Skateboarding Federation (ISF) is the formally organized and not-for-profit world governing body for skateboarding. It was established to provide direction and governance for the sport of skateboarding globally and to ensure the best possible representation of skateboarding is experienced by athletes and fans. The ISF aims to preserve skateboarding’s integrity and authenticity as a sport, passion and lifestyle with freedom of self-expression and creativity at its core. Learn more at www.internationalskateboardingfederation.com. Women’s Skateboarding Alliance (WSA) is a global management and consulting agency dedicated to authentically representing the industry voice of women’s skateboarding. WSA educates, improves and delivers the most current trends and information for women’s skateboarding worldwide. The executive leadership collective is comprised of top women in Action Sports: Mimi Knoop, Lisa Whitaker, Kim Woozy and YuLin Olliver. WSA operates in conjunction with its nonprofit division, Action Sports Alliance. For more information, visit womensskateboardingalliance.com and follow @thealliance_wsa. Read more at business.transworld.net.